"LOOK MA! --- NO TIRES"
He has built working versions and even demonstrated a flying version for the U.S. Patent Office in order to win his patent. Scott's patent filings, videos and work have been demonstrated since 1999. His improvements on the technology, which even overcame a NASA patent on an earlier version of the technology have overcome the latest limitations demonstrated by the MIT effort. This has potentially opened new and unexplored possibilities for aircraft which are quieter, mechanically simpler, and do not emit combustion emissions. In the near-term, such ion wind propulsion systems are used to fly less noisy drones. Further out ion propulsion paired with more systems will be used to create more fuel-efficient, hybrid passenger planes and other large aircraft. The technology is known under a variety of names: ionic wind, electroaerodynamic thrust, ion air drives and microthrusters — a physical principle that was first identified in the 1920s and describes a wind, or thrust, that can be produced when a current is passed between a thin and a thick electrode. If enough voltage is applied, the air in between the electrodes can produce enough thrust to propel a car or aircraft. For years, electroaerodynamic thrust has mostly been a hobbyist’s project, and designs have for the most part been limited to small, desktop “lifters” tethered to large voltage supplies that create just enough wind for a small craft to hover briefly in the air. It was largely assumed that it would be impossible to produce enough ionic wind to propel a larger aircraft over a sustained flight. Scott's patent and trade-secret technologies overcame the sustained flight limitations using a number of novel options. The MIT team’s final design resembles a large, lightweight glider. 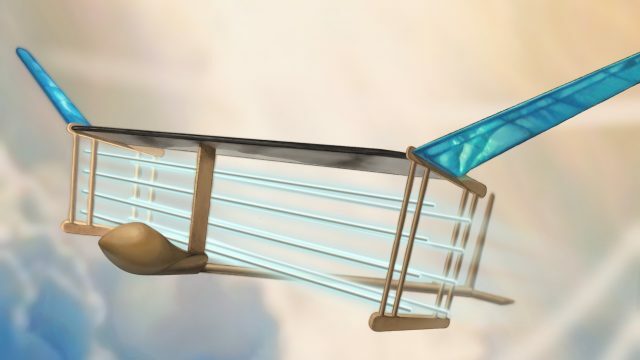 The aircraft, which weighs about 5 pounds and has a 5-meter wingspan, carries an array of thin wires, which are strung like horizontal fencing along and beneath the front end of the plane’s wing. The wires act as positively charged electrodes, while similarly arranged thicker wires, running along the back end of the plane’s wing, serve as negative electrodes. The fuselage of the plane holds a stack of lithium-polymer batteries. MIT's ion plane team included members of Professor David Perreault’s Power Electronics Research Group in the Research Laboratory of Electronics, who designed a power supply that would convert the batteries’ output to a sufficiently high voltage to propel the plane. In this way, the batteries supply electricity at 40,000 volts to positively charge the wires via a lightweight power converter. Scott's team has improved on increasing the efficiency of the design, the materials, the atmospheric modifiers and other techniques to produce more ionic wind with less voltage. Scott's team has increased the design’s thrust density — the amount of thrust generated per unit area over the MIT design. Scott's team maintains that such technologies are already in use in the defense and aerospace sectors. His "A-Team" is working on a retail product to be premiered "when it is ready for the public" sometime in the future! If we place a solid dielectric inside the EmDrive’s cavity then, essentially, we will have an asymmetric capacitor subjected to electromagnetic radiation, i.e. the dynamical Biefeld-Brown effect (the Abraham force). What if we do not place a solid dielectric inside the EmDrive’s cavity? Then EmDrive’s thrust is still due to the Abraham force, because the Abraham force appears not only in solid dielectrics, but also in liquid and gasdielectrics, like air in the EmDrive’s cavity. tldr Thrust data from forward, reverse, and null suggested that the system was consistently performing at 1.2±0.1 mN/kW, which was very close to the average impulsive performance measured in air…The current state-of–the-art thrust to power for a Hall thruster is on the order of 60 mN/kW. This is an order of magnitude higher than the test article evaluated during the course of this vacuum campaign; however, for missions with very large delta-v requirements, having a propellant consumption rate of zero could offset the higher power requirements. The 1.2 mN/kW performance parameter is over two orders of magnitude higher than other forms of “zero-propellant” propulsion, such as light sails, laser propulsion, and photon rockets having thrust-to-power levels in the 3.33–6.67 μN/kW (or 0.0033–0.0067 mN/kW) range.